Having trouble finding your perfect design or flooring finish? With our custom flooring service, you'll work with us to design a unique flooring solution that is tailored to your meet your specifications.When it comes to choosing a flooring it can be very difficult to find something to match your unique decor. At S&G Carpets we offer a vast range of design floors which allow you to add your own twist to your chosen flooring type.With the availability for borders, feature strips, corner stones and patterns, the opportunities for personalisation are endless. Vusta flooring have created a selection of flooring that emulate the look and characteristics of Wood and Stone Flooring. Vusta design flooring replicates the beauty and texture of natural materials, using the same styles and designs such as planks and tiles with and without bevels, with light or heavily embossed surfaces and even with synchronised embossing, where the individual pores of the wood or stone are synchronised with the print of the grain to give an authentic look which is hard to differentiate from the real thing. 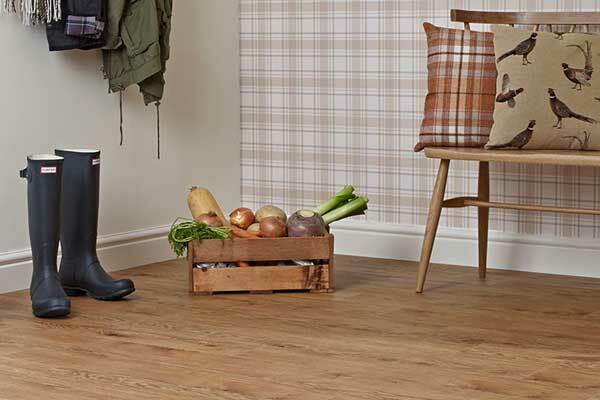 Vusta flooring offers the ultimate mix of versatile design and affordable quality. All the beauty of nature with consistency of design. S&G Carpets regularly provide Vusta flooring to domestic and commercial clients across Devon and North Cornwall, including Bideford, Barnstaple, Torrington, South Molton and Bude. To view our range of Vusta flooring and discuss your options with a trained advisor, visit our showroom in Torrington, or alternatively arrange a home visit by either calling us on 01805 623112 or completing our online enquiry form. We’ll come to you free of charge to measure up and provide estimates, we’ll also bring samples with us for you to see how different colours will work alongside your decor and furniture.